After 16 years, the Ballpark in Jackson is getting a much needed face lift to the playing surface. As soon as the home schedule ended on August 27, work began to replace and improve the drainage and irrigation systems. During the past few days, the final phase of laying sod has begun. Take a look at the time lapse of pictures and see how the surface is coming together. 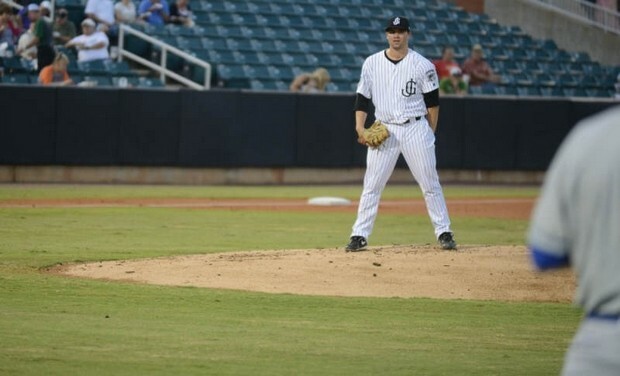 On August 19, in Mobile, Julio Morban gave everyone a scare when he broke his right fibula sliding into second base. The scene was reminiscent of Carlos Triunfel’s broken leg back in 2009 in Montgomery. But, for Morban, who I talked too on Wednesday, things are going well in his rehab. Morban batted.295/.362/.468 with 20 doubles, 5 triples, 7 home runs and 44 RBIs in 86 games for the Generals in 2013. Hit batted .315/.381/.519 against right-handers and .241/.310/.329 against left-hadners. When he was healthy, Morban was one of the top offensive players in the Southern League, but due to his total number of plate appearances, he did not qualify for the league leaders. His best month was undoubtedly the month of May when he batted .349/.391/.523 in 22 games. Remember this? On March 15, the day Morban was sent down to minor league camp he hit two home runs against the Angels during Seattle’s 8-5 win. His first homer came off of Tommy Hanson and the second came against Billy Buckner. Jeremy Bonderman earned the win that day for the Mariners. Cam Hobson starts the season finale today in Huntsville. 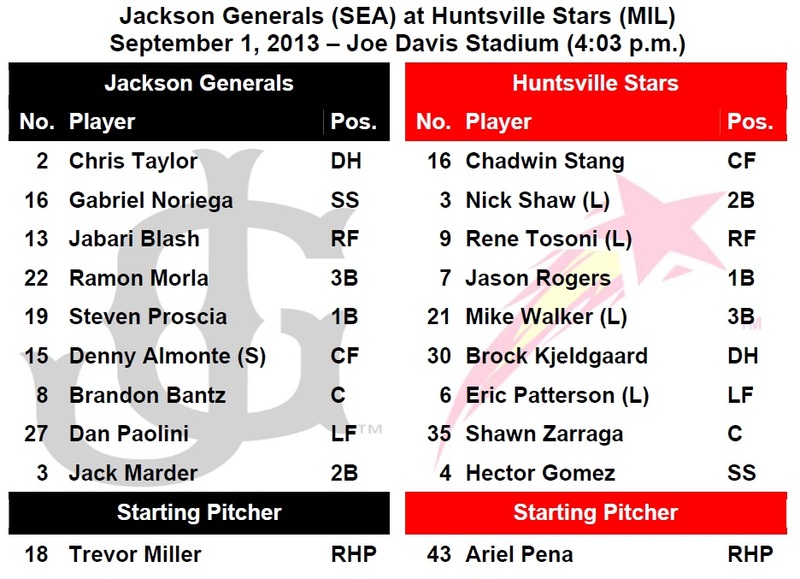 TODAY’S GAME: the Generals conclude the 2013 season with the rubber match of the 5-game road series with the Huntsville Stars (2-2)…this season Jackson is 9-8 against the Stars and 5-4 at Hank Aaron Stadium…the Generals are 7-8 in day games this season and are 7-6 in rubber games of a series. GENERALS RECAP: The Generals dropped their 2nd straight game to the Huntsville Stars, only collecting 4 hits in the 7-0 shutout loss. The pitch count got high early for Trevor Miller (L, 3-2, 4.73), who could not make it past the fourth inning. The right-hander surrendered only six hits, but they were partnered with six earned runs. Miller struck out five, but walked three with his 96 pitches. The Jackson bats were unable to help Miller through his struggles. Ariel Pena was sharp through five frames. Pena allowed only two hits and complimented it with six strikeouts. Chris Taylor (2-4) and Jabari Blash (1-3) led the way for the Generals on offense. NEWS & NOTES: 47 of 134 games have been 1-run games (20-27) which is the T-1st in the Southern League…68 of 134 games have been decided by 2-or-fewer runs (26-42) and 17 have been extra-inning games (5-12)…In games decided by 3+ runs the Generals are 33-28. • WINNING AUGUST: The Generals finished up the month of August with a 16-15 record, which was the first month with a winning record during the 2013 season. Jackson batted .255 with 21 home runs, 117 runs, 40 stolen bases and 3.56 pitching ERA. • BLASH-T OFF IN DOUBLE-A: OF Jabari Blash has hit safely in 19 of 27 games since being promoted to Jackson, batting .319 (30×94) with 13 runs scored, 3 doubles, 9 home runs, 21 RBI and 19 walks. Blash homered twice in the 4th inning on Friday and has 25 home runs this season leading all of Mariners Minor Leaguers. His 5 RBIs during the 4th inning was the most in a single inning in franchise history. • NO DOG DAYS FOR TAYLOR: INF Chris Taylor finished up the month of August batting .333 (39×117) with 22 runs scored, 5 doubles, 1 triple, 8 RBI, 18 walks and 10 stolen bases in 31 games in August. • BLACK JACK IS BACK: INF Jack Marder has hit safely in 7 of 10 games batting .324 (11×34) with 3 runs, 3 doubles, 1 home run, 2 RBI and a .410 on-base percentage. • 3-HOMER GAME FOR PROSCIA: INF Steven Proscia hit 3 solo home runs on Aug. 26 vs. Chattanooga. It was his 8th career multi-home run game and 2nd this season (last: 2, 6/23 vs. Mobile w/Jackson). It also marks his 3rd career 3-home run game (also: 4/19/12 vs. Inland Empire and 7/14/12 vs. Stockton w/High Desert). He is 1 of 24 minor league players to hit at least 3 home runs this season, but the first Mariners farmhand. • THE SEATTLE GENERALS: Taijuan Walker and Abraham Almonte became the 9th and 10th different 2012 General to make their MLB debut this season for the Mariners last night…they joined Mike Zunino, Jesus Sucre, Brandon Bantz, Brad Miller, Nick Franklin, Yoervis Medina, Brandon Maurer and Bobby LaFromboise… Seattle had 8 MLB debuts in 2012, and 12 during the 2011 season. 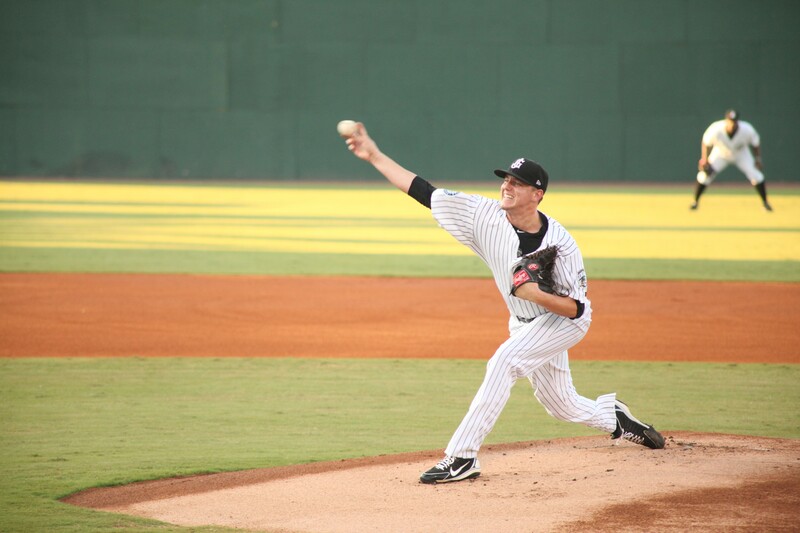 • CLOSING TIME: RH Carson Smith has allowed only 1 earned run over his last 27.2 innings (0.33 ERA), including 15.2 consecutive scoreless innings (since July 23). After allowing 5 runs over his first 6 appearances of the season, Smith has allowed only 5 earned runs over his last 37 relief appearances. During this stretch he is 0-1 with 11 saves and a 1.03 ERA (5 ER, 43.2 IP). Since April 22, Smith has lowered his ERA from 8.44 to 1.84. Smith has struck out at least 1 batter in 38 of 43 games (70 strikeouts). • THE RELIEVING MA-SCHEEN: RH Stephen Kohlscheen has allowed only 3 earned runs over his last 33.0 innings (0.82 ERA). During this 19-game stretch (since June 26), he is 5-0 with 1 save. • WE GOTCHA!! Jackson catchers lead the SL catching 51.5% of base stealers (68 CS, 132 Att). 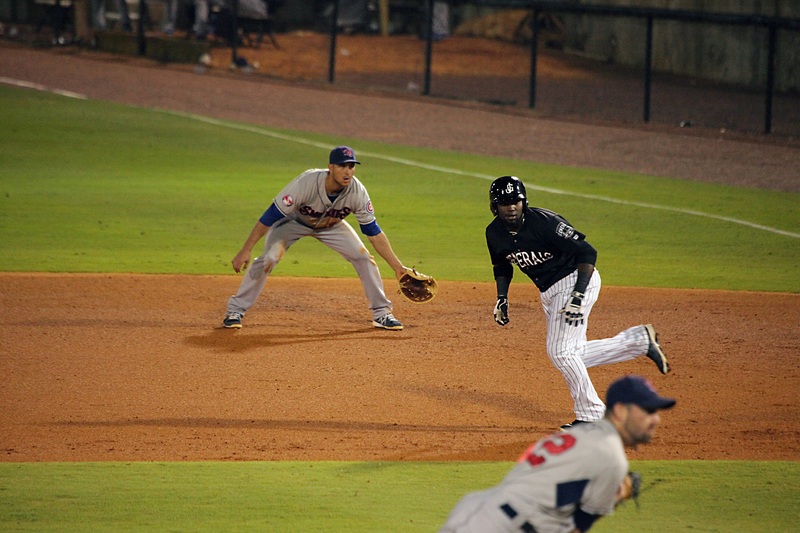 The next closest is Pensacola which is throwing out 34.8% of base stealers. Trevor Miller starts today and was 3-0 with a 2.76 ERA in 5 August starts. TODAY’S GAME: the Generals continue their final series of the season tonight with the game #4 of a 5-game road series with the Huntsville Stars (2-1)…this season Jackson is 9-7 against the Stars and 5-3 at Hank Aaron Stadium…this is the first start time before 5:00 p.m. for Jackson since a 4:00 p.m. start on July 7, at Pensacola. GENERALS RECAP: The Generals scored 2 runs in the 6th inning and 1 in the 9th inning, but it wasn’t enough as Jackson lost to Huntsville 3-5 on Saturday. DH Ramon Morla (2×4, 2B, 2 RBI) led the team with 2 hits, while 3B Gabriel Noriega (1×4, R), SS Chris Taylor (1×3, BB, SB), C John Hicks (1×4, 2B, RBI) and 2B Jack Marder (1×3, R, 2B) each recorded 1 of the Generals 6 hits. Starter Anthony Fernandez (6.0,7,5,5,3,3,HR) recorded his 8th loss of the season, allowing 5 runs on 7 hits in 6.0 innings. RH Stephen Kohlscheen (1.0,1,0,0,1,2) and RH Kevin McCoy (1.0,1,0,0,2,1) combined to hold the Stars scoreless over the final 2.0 innings in relief. NEWS & NOTES: 47 of 133 games have been 1-run games (20-27) which is the T-1st in the Southern League…68 of 133 games have been decided by 2-or-fewer runs (26-42) and 17 have been extra-inning games (5-12)…In games decided by 3+ runs the Generals are 33-27. • BLASH-T OFF IN DOUBLE-A: OF Jabari Blash has hit safely in 18 of 26 games since being promoted to Jackson, batting .319 (29×91) with 13 runs scored, 3 doubles, 9 home runs, 21 RBI and 19 walks. Blash homered twice in the 4th inning on Friday and has 25 home runs this season leading all of Mariners Minor Leaguers. His 5 RBIs during the 4th inning was the most in a single inning in franchise history. • BLACK JACK IS BACK: INF Jack Marder currently has a 5-game hitting streak, batting .500 (9×18) with 2 runs scored, 1 double, 1 RBI, 2 BB and 1 stolen base. In his last 10 games he is batting .343 with 3 runs, 3 doubles, 1 home run, 2 RBIs and 3 walks. • WALKER WINS AND MAKES HISTORY IN MLB DEBUT FRIDAY: Taijuan Walker became the youngest Mariners starting pitcher to win his MLB debut last night at 21.017 years of age…Walker is just the 11th pitcher in Mariners history to win his starting debut; he is just the second (joining Pat Rice, 5/18/91 @NYY) to not allow an earned run AND record a win…Erik Hanson (9/5/88 @MIN) is the only other starter to allow 0 ER in his debut, but he lost 2-0.